5. (? 8 soldiers) Bloody angle. Park at the parking lot for Hartwell Tavern. 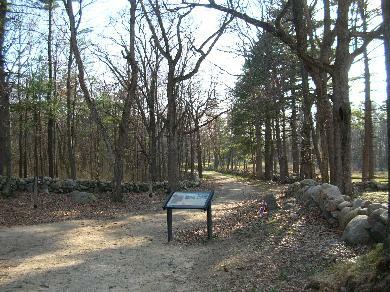 The marker is down the trail to the west (left). 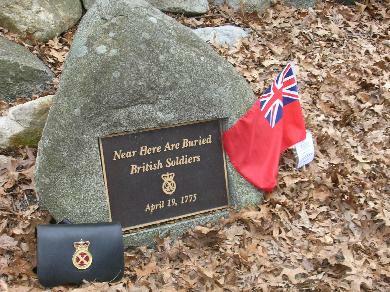 The grave marker is at approximately the 14 1/4 mile maker and is next to the explanatory panel for the �Bloody Angle�. �A short but sharp contest ensued, at which the enemy received more deadly injury, than at any one place from Concord to Charlestown. Eight or more of their number were killed on the spot, and no doubt, many wounded. The enemy soon retreated under a scattering fire, in which one of their musicians fell.� (quoted in Samuel Adams Drake). �A few rods beyond the Hartwell Tavern another grenadier fell, on the green grass before a pair of bars.� The caption to the picture states that the pair of bars (a wooden rail fence) is between the two Hartwell Houses.